Corsair’s “Void” USB gaming headphones are not actually a black hole of nothingness. They’re just a pair of pretty good headphones; staring into them yields very little. 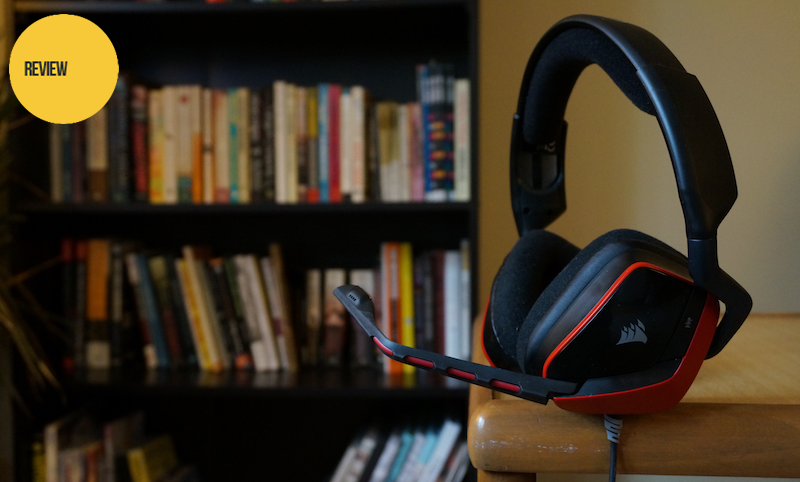 The headset acts as a wired middle-point in Corsair’s line of Void gaming headphones, above their plain wired stereo headphones and below the wireless Void RGB 7.1. The Void USB does what most gaming headsets do: It plays video game sounds into your ears and lets you talk into a microphone to anyone who might be listening. They’re currently going for $59.99. Corsair sent me one to try out about a week ago, and I’ve been using it for a bunch of games. Before we get into the likes and dislikes, let’s take a look at this thing. Official product shot; the USB dongle is not actually the size of the headphones. The headset is straightforward. It’s a fairly standard unit with a built-in microphone. It comes with a small USB dongle that, in conjunction with Corsair’s Utility Engine PC software, acts as a Dolby Headphone decoder. Let’s break down the goods and the bads. Good fit. The Void headset fits snugly over my head, and the earcups offer a compressed but mostly comfortable fit. I’d initially thought they looked a little bit small, but they fit my ears and eliminate a fair bit of outside noise. It starts to hurt the top of my head if I play for more than a couple of hours, but I’ve yet to own a gaming headset that doesn’t do that at least a little. All in all: good fit. Solid audio quality for the price. These are sub-$100 headphones, so I didn’t go in expecting audio quality on par with $250 studio headphones or anything. But the Void sounds pretty good, all things considered. It doesn’t suffer from the brittle highs or weak lows of some other gaming headsets, and in general presents a clear soundscape across the full EQ spectrum. I wouldn’t use these for listening to music, but that’s because I have a different set of headphones I use for that; as an ordinary pair of stereo music headphones, the Void sounds fine. Sweet dongle. The Void is really just a stereo headset with a built-in mic; the included Dolby headphone adapter is what gives it the ability to play PC games in simulated 7.1 surround. I really like the USB dongle. It’s small, and it lets me plug in whichever headphones I want and get headphone surround. I wish Corsair sold the dongle separately, since it’d be worth picking up for folks who already own a stereo gaming headset and want to get headphone surround on PC. A Corsair rep told me that they’re planning to sell the dongle on its own later this year. Bummer microphone. The Void’s microphone isn’t that good. There’s no wind filter, and you can’t easily adjust how far it sits from your mouth, so I’ve been getting a lot of noise from my breath and words that begin with P and T.
I lowered the mic gain basically all the way and still got a clippy, brittle sound, and the only way I could eliminate outside noise was to slide the mic up until it was above nostril-level. So, not a great showing for the Void. People with different head shapes or breathing patterns might not have the same problems I’ve had, but the mic quality overall seems poor. Definitely something to keep in mind when considering this headset. Limited surround field. I prefer the Void’s headphone surround to stereo, particularly for first-person gaming, but I do wish there were a few more options for tweaking the field of the “speakers” in the headset. Corsair’s software lets you choose between one of five EQ presets, and you can also make your own custom EQs. There’s no real way to adjust the size of the virtual room, or push the rear speakers out or in. The Void headset generally has a closer stereo field than some other gaming headsets, which causes each surround speaker to sound closer to the other ones. It’s not a huge deal, but it’d be nice to be able to tweak the virtual speaker layout. Stereo only on consoles. The headset is billed as being compatible with game consoles, because it is—it’s a stereo headset with a microphone, so you can plug it into a Wii U gamepad, a PS4 controller or an Xbox One controller and it’ll work like any other pair of stereo headphones. I’m not sure there’s a reasonable way to expect the Void to be able to do headphone surround on every system—it’d basically need an optical input to do that—but it’s definitely easier to recommend it to PC gamers than to console gamers who could get a comparable stereo gaming headset for cheaper. It’s plastic, and it will break. This complaint is true of every gaming headset I’ve ever tried, but: The Void is made of plastic, and plastic breaks. It feels sturdy enough, but a year of solid use will almost surely take a toll, and I’d have a hard time imagining this headset surviving more than a year or two of heavy use. If you buy these, be prepared for them to eventually break. Corsair’s Void USB surround headset is a decent choice for PC gamers who want a headset that can provide Dolby headphone surround without going over a hundred bucks. Its lackluster microphone makes it a weaker choice for people who do a lot of multiplayer gaming, though it is possible to get better chat audio if you don’t mind moving the mic to nose level. It’s also less of a natural choice for those looking for a headset for both PC and console gaming, since it can only do proper Dolby headphone surround on PC. The bundled Dolby Headphone USB dongle is very cool, and if you already have a pair of stereo gaming headphones that you like, keep an eye out for when Corsair makes it available for purchase separately.